NOTE: This post was scheduled by Daniel Saraga of Haggis and Herring before he suddenly passed away. We have decided to ensure his scheduled posts continue. Daniel's wife Meredith posted her eulogy. Please read more about our wonderful Daniel. September cooled down right away, just the way I like it. I dislike hot-and-sticky August. 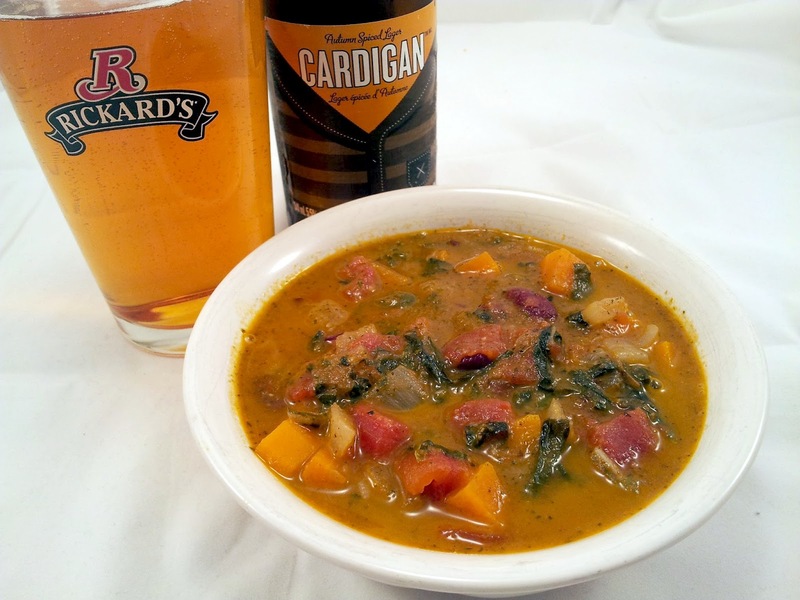 Cool nights, warm soup, some hearty bread and a beer. That's my idea of a September dinner. Earlier that week, I read Chaya's Swiss Chard Soup recipe and it inspired me. I knew I had to make my own version. You can read Chaya's post if you'd like to learn more about Swiss chard. Well, I've made my first soup of the season, and according to Meredith, I've set the bar high. The cheese in the soup really complimented the beer. We nearly finished the entire pot ourselves - with barely enough left over for lunch the following day. Heat oil in a deep pot on medium and fry onions for 3-5 minutes. Add garlic and carrots and continue fry for another 3-5 minutes. Add Swiss chard and stir for 2-4 minutes, until wilted. Add broth, beans, thyme, salt, oregano, and pepper, stir, cover and bring to a boil. Reduce to medium and let simmer, covered for 30-40 minutes. Remove 1 cup of vegetables into a separate container and and using an immersion blender, puree. Add pureed vegetables back to pot, stir in cheese, and serve. We wouldn't have it any other way. We had to let the last few posts be scheduled out as my brother wanted. Incredible to still read Daniel's posts. His blog continues to be an amazing tribute to him. This soup looks incredible, perfect for fall. I am sure Daniel would appreciate knowing his posts are going up as he planned.